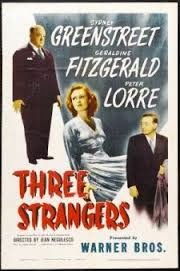 Synopsis: London barrister Jerome K. Arbutny (Sydney Greenstreet) is walking along the street when he meets beautiful Crystal Shackleford (Geraldine Fitzgerald). After a bit of flirtatious small talk, she invites him up to her apartment. Once there, he is dismayed to find another man already there, a cheerful tippler named Johnny West (Peter Lorre). Johnny was lured up to her apartment with the same come-hither glance that roped in Arbutny. Crystal reveals the reason for bringing the two men to her apartment. Crystal has in her possession a statue of Kwan Yin, the Chinese goddess of good fortune. According to legend, Crystal says, if three strangers make a wish over the statue at midnight of the Chinese new year, the wish will be granted. If there is one wish they can agree on, they can all share in the good fortune provided by Kwan Yin. Johnny has an Irish sweepstakes ticket, and he suggests they all wish for it to be a winner, then sign an agreement to divide any winnings from the ticket. The others quickly agree to this, and a contract of sorts is hastily written up. The clock strikes midnight as the strangers concentrate on their wish, and it seems for a moment that the statue is smiling at them; but soon the moment is gone and the three go their separate ways. We then follow the strangers in turn and discover that each one has arrived at a moment of crisis in their lives. Crystal's estranged husband David (Alan Napier) has fallen in love with a Canadian woman and wants a divorce, but Crystal refuses to grant one. Arbutny has made a series of unwise investments with money entrusted to him by the widowed Lady Beladon (Rosalind Ivan). Facing professional ruin when the secret gets out, he has decided to propose marriage to her in order to conceal his financial mismanagement. Meanwhile, Johnny has fallen in with a rough crowd, and he is currently being sought for a crime he didn't commit. 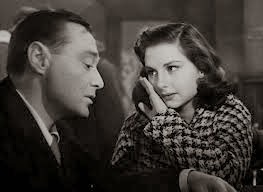 His only hope for redemption lies with his girlfriend, the devoted Janet (Marjorie Riordon). Comments: There is so little to this Warner Brothers trifle that could be considered horror -- even borderline horror -- that I actually went back to the Minneapolis Tribune archives to make sure I had the right movie. According to the schedule, I did. 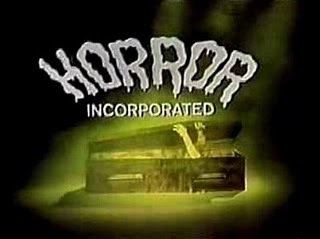 But I suspect the audience tuning in on this particular night didn't agree - which leads us, inevitably, to the late lamented Monster Chiller Horror Theater. It seems likely that this movie found its way onto the KSTP schedule because of a) its slight element of fantasy and b) the presence of Peter Lorre in the cast. A newspaper logline might lead you to believe that the fantasy elements are stronger than they actually are. And I suspect that lured many an unsuspecting viewer to the tube that evening. 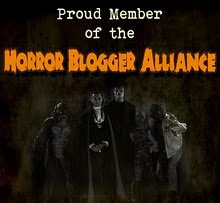 In fact, horror movie fans weren't the only ones likely to feel cheated. The presence of Lorre and Greenstreet (and the Warner Brothers logo) fooled many over the years into thinking that it's a film noir. But it's far too light a confection to fit into that category either. Okay, so it's not a horror film. How does it stack up as a movie? I wish that I could answer that, but as I spent the whole time trying to weigh its (ultimately non-existent) horror content, I'm afraid I didn't really give the movie a fair chance. Much like the Ingmar Bergman movie on Monster Chiller Horror Theater, it's got to be judged on whether it delivers the scares. And unfortunately it doesn't. The tenuous fantasy element is just a bit of whimsy, really, and doesn't drive the plot to any real extent. 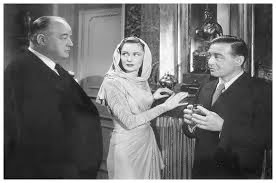 But Peter Lorre is quite winning as Johnny West, and Sydney Greenstreet is pleasant to watch in any role. Geraldine Fitzgerald is quite engaging as the one who dreams up the whole scheme and she is also, as you might expect, as beautiful as the dawn. Synopsis: A Sing Sing inmate named Quinn (Jack Holt) is plotting an escape. 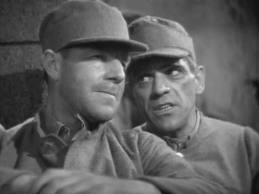 His cellmate Henderson (Boris Karloff) advises against it, claiming that powerful friends will spring both of them soon if they are patient. But seeing that Quinn will not be deterred, Henderson tells him how to get in touch with his associate on the outside, a man named Arnold (Claude King). Quinn’s escape is successful and he travels to Arnold’s mansion in the country. Arnold seems afraid to assist Quinn, but is too frightened of his employer, the mysterious drug kingpin Mr. X, to refuse. He employs Quinn as his chauffer, and Quinn becomes enamored of Arnold’s beautiful daughter Julie (Constance Cummings). Soon enough Henderson is released and makes contact with Dr. August Steiner (Edward Van Sloan), who runs the Eastland Hospital. We learn that Steiner is also an agent of Mr. X , and he tells Henderson that Mr. X arranged for him to be incarcerated so long because he was displeased with him. Henderson suggests Quinn as the perfect man to deliver the next drug shipment for the organization. But as soon as Steiner sees Quinn he knows the man is an undercover federal agent. Henderson is shocked and angered by this revelation. But the plan to have Quinn to pick up the shipment via seaplane goes forward. After Quinn delivers the drugs to a ship at sea, Henderson instructs Quinn to take off and then bail out – the boat, he says, will come to his location and pick him up. Quinn, sensing that this is an attempt to dupe him, quickly “rigs a dummy”, attaches it to the parachute and tosses it overboard so that Henderson will think it’s him. But before long Steiner captures Quinn himself. He plans on disposing of the federal agent in his usual manner – by getting him admitted to his private hospital and subjecting him to an unnecessary – and fatal – operation…. Comments: Listen up, you mug. We're gonna watch Behind the Mask again. Why? Well, you sat through Three Strangers, didn't ya? Sure, you felt a little cheated when nothing scary happened in the first feature. And Behind the Mask isn't exactly a horror movie either. But it's a real meat-and-potatoes murder story, buster. Jack Holt is such a tough guy he shoots himself in the arm, just to gain the confidence of his fellow hoods. Dr. Steiner's got a hospital where he gives people unnecessary operations. Everybody's scared of hospitals, right? Plus the evil Mr. X has more high-tech gadgets than a Bond villain. He's even got a telephone answering machine! With that kind of futuristic technology, the feds are going to have a hard time catching up with him! Look, I've written about this movie before, and I don't have a lot more to say about it. That's because I'm a man of few words -- a man of action. And this is the kind of movie a real man can sit down and watch with a beer in his hand. You're not going to find a lot of people sitting around and crying or talking about their feelings. Nope, it's all prison escapes, shootouts, secret passages, betrayals, fistfights and manly dialogue. And mister, that's my kind of movie. I would have been grateful to catch THREE STRANGERS on Chiller Theater, but such was not the case (it certainly sounds intriguing). 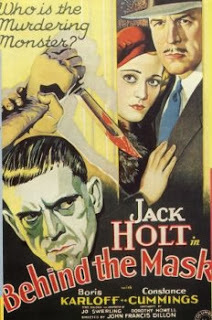 I too have little to add about BEHIND THE MASK; however, since I recently viewed Jack Holt opposite Lugosi in 1935's THE BEST MAN WINS, he's still a laconic man of few words.